Here's a fun bit of trivia - a new SKU is hitting stores! 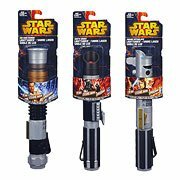 In my quest across the desert, I found a Walmart and a Target that each had assortment #A1189, which is a new basic Lightsaber assortment - not refreshed packaging for the previous assortment, but a new SKU with a new DPCI at Target. The lightsabers themselves are not particularly exciting, but it does mean Hasbro is shipping brand-new product to stores right now and you should probably start keeping your ears open and watching your pre-orders. Good hunting, gentlemen.